When I was catering, I did a lot of brunches and breakfasts for ladies... usually holiday breakfasts, or baby and wedding showers. I learned so much about how women eat - especially around other women. I would be so disappointed that they would skip over the giant cinnamon rolls I had slaved over. Sure they would oh and ah at them, but no one would be willing to fill their plate with the huge pastry. 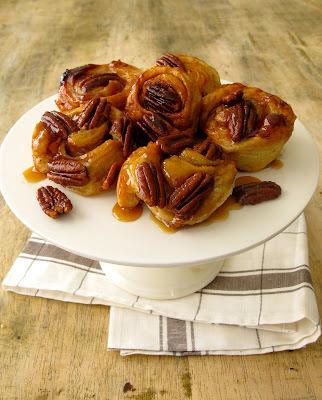 However, when I started making these smaller Pecan Sticky Rolls, they were a hit - the ladies would even ask for seconds! Maybe it was the more petite size, or perhaps the lack of frosting? Maybe the caramel pecan glaze (made from a simple schmear) was too much to resist?! When I was in college working at a bakery, I discovered 'schmear.' Schmear at this bakery didn't mean cream cheese on a bagel... but, a smooth mixture of butter and brown sugar that was 'schmeared' on the bottom of the muffin pan before the cinnamon rolls were put in. After baking, we inverted the rolls onto a tray to reveal that the schmear had created a caramel glaze that cascaded over the rolls. That sounds easy (and delish), right? It gets better. Instead of slaving over homemade bread dough to make the cinnamon rolls like they did at the bakery, now I use frozen Pepperidge Farm Puff Pastry. Instead of the typical fluffy, doughy cinnamon rolls (fabulous in their own right), the Puff Pastry creates a buttery, flakey roll that is, well, soooo good. I also love that they are smaller than the normal over-sized bakery cinnamon rolls - they are a perfect indulgence to serve at brunch or with a cup of coffee. You can prepare these ahead of time (great to have around for the holidays...) by following the directions below, then putting them into the freezer instead of the oven. When you are ready to bake them, just let them sit out for 10-20 minutes before they go into the hot oven. *Let frozen Puff Pastry sit out to thaw for 20 minutes before using. Fold the Puff Pastry sheets out on a lightly floured surface. Spread 1 tablespoon of softened butter out onto each sheet. Next, spread half of the 1/4 cup of sugar and 1/2 cup of brown sugar onto each sheet. Sprinkle 1 tablespoon of cinnamon onto each sheet. Roll the sheets into long rolls, then cut them each in to 6 even pieces. Create the schmear by creaming together 12 tablespoons of butter, salt and 1/2 cup of brown sugar. Scoop a tablespoon of the mixture into the bottom of each cup of a large muffin pan. Put 4-5 pecans on top of the schmear mixture, pressing it down. Put a slice of the cinnamon roll, spiral side up, in each muffin cup. Place the muffin tin on a baking sheet - just in case they will bubble over in the oven. Bake for 25-27 minutes, until puffed and golden. Let them cool in the muffin pan for 2 minutes - only! Place another sheet pan on top, and invert them, removing the muffin pan. 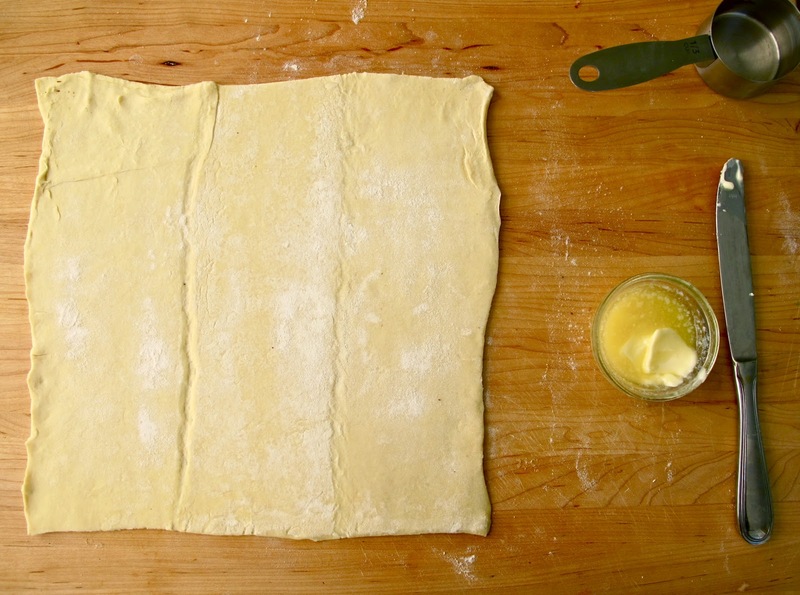 Unfold the puff pastry sheet. Slice each sheet into 6 pieces. You can even do 8 if you wan to stretch it. Put a scoop of schmear in each cup. Then smash it down with the pecans. I like the look of pecan halves, but you can use pieces, too. Place the rolls on top of the pecans (I only made 6, using just one sheet). Want to make these ahead of time? This is the point you can wrap them up and stick them in the freezer! Puffed and baked. I used an extra large jumbo muffin tray, but you can use a normal size. Yours will be more overflowing if you use a standard muffin tray... both work great. Place a pan (upside down) on top of the other tray, then flip. Look how ooey, and goey! These are so easy to make, they're great for any old Saturday morning, or a special brunch. Is the amount of butter correct? I made these and they were so greasy they were ruined. I'm willing to try again! P.S. I love your site and blog. I read it daily! Let me know if you find something that works better for you! Oh, and make sure your oven is at 400 - a cooler oven can just cause the butter in the puff pastry to melt, vs. puff up. These were amazing...I probably will never buy store bought cinnAmon rolls again.